My friend has recently been in hospital for major surgery, she is back home now and I went to visit her yesterday taking with me a lunch of this Leek Tart. The recipe is in the February edition of Delicious Magazine and not available on the website yet, but hopefully it will be once the March edition is published. 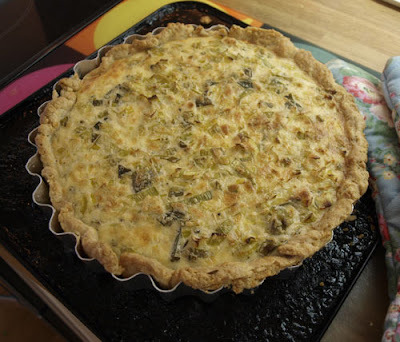 I have to say we were both mightily impressed by this tasty tart, the cheesy pastry and leek, creme fraiche and egg filling (I also added an 50g of cheese to the filling mix) was moist and the pastry was still crisp underneath - hurrah, no soggy bottom! I accompanied the tart with a roasted tomato salsa. The cherry tomatoes were roasted because they were just not quite as ripe as I would have liked, so I drizzled them with olive oil and a little salt and stuck them in a hot oven for 10 minutes. Once they had cooled, I mixed them with diced celery, cucumber and coriander, poured in the remaining roasting oil and a little white wine vinegar. No photos of that I'm afraid as I was hurrying out the door to get to my friend's house for lunchtime! That looks fab. My mouth was watering as I read your description and what you served it with. Yum! I hope your friend is recovering well. It's really nice of you to bring such a beautiful tart - I'm sure it made her feel better! Oh now that does look tasty ... and with all that glorious sunshine outside I might even be tempted to take it on a picnic!! A sweet and thoughtful way to spend time with a friend who is recuperating! The tart sounds so flavorful and great idea to add a bit of roasted tomato salsa! What a kind and thoughtful gift for your friend Janice, I'm sure she really appreciated such a delicious present! I hope your friend's recovering well Janice! That tart looks delicious and I imagine the toms were perfect with it! Oh yum! I do love a good tart/quiche, and this one looks lovely. I like the idea of adding plenty of cheese to it, cheese and leeks seem to go very well together! What a coincidence - I also posted a leek quiche today. Yours looks lovely and packed full of leeks. Oh that brings back really happy memories of lovely meals just across the channel. I've never tried making my own, though. Looks lovely. I can't believe it. 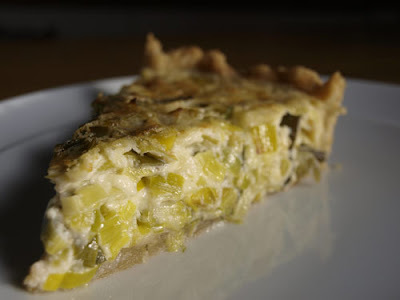 I am just about to write a post on leek tart and you and Corina have just done the same. I guess leeks are just in season right now! Good god that looks amazing, its one of my most favourite things to make so you can have it in the fridge and cut a slice off whenever you so please!! !